Hawaiian sweet bread was my favorite sandwich bread growing up, though I did not have it often. Even better was the fact that not only could I use it to make my peanut butter and jelly before school, but when there was a loaf of it in the house I could have really delicious toast for breakfast, too. Hawaiian sweet bread seems to be the same thing as Portuguese sweet bread, a name which is slightly more common. The brand that I always bought was King’s Hawaiian Sweet Bread, which was soft, buttery and, of course, sweet. 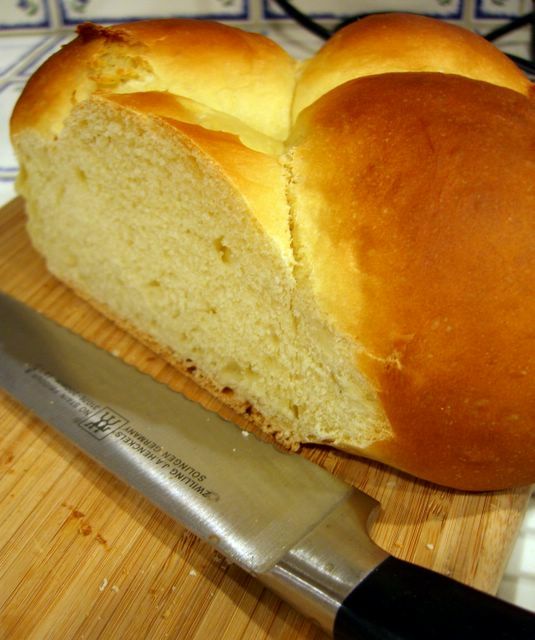 Hawaiian sweet bread is similar to breads like challah and brioche in that it is enriched with both egg and butter. Unlike those two, however, it has a tiny bit less added fat and a lot more sugar. Because it is also found in the Philippines, it seems likely that the recipe for the bread was spread by Portuguese sailors and settlers, traveling through the East Indies and other parts of the south Pacific. Working with the ingredients of King’s Hawaiian as a guide, I tracked down a recipe that seemed as though it would be a reasonable facsimile. The ingredients list flour, water, milk, sugar, margerine, eggs, butter, yeast and potato flour. A few ingredients, like high fructose corn syrup, I chose to disregard. The inclusion of potato flour is what keeps the bread moist and soft for several days after it is baked. I almost never use potato flour, preferring instant mashed potato flakes instead (potato flour is essentially the same thing, but approximately five times the price). This recipe, and slightly variations thereof, can be found all over the web and it is the one I decided to base my own recipe on. The best way to mix this bread is using an electric or stand mixer, as it takes some time for the dough to come together. You can work the butter and extra flour in by hand, of course, but it really is much easier if you have a mixer. The dough is soft and heavy, with a lovely yellow tinge from the egg yolks. I chose to make free form loaves, but this dough can be put into two loaf pans, as well, for more traditional sandwich sized bread. It is sweet, buttery and everything that I hoped it would be – minus the high fructose corn syrup. In a large bowl, preferably the bowl of an electric mixer, conbine yeast, warm water, 1 tablespoon of sugar and the mashed potatoes. Let stand for 5 minutes. Add remaining sugar, lemon juice, milk, salt, eggs and 2 cups of flour, mixing very thoroughly with the paddle attachment of your mixer. Switch to dough hook. Add 1 1/2 cups more flour and butter, cut into chunks. Mix on low speed until smooth, then add remaining flour a few tablespoons at a time until dough comes away from the sides of the bowl and clings to the dough hook. Place on a lightly floured surface and knead for 2-3 more minutes to ensure smoothness. Place dough in a large bowl and cover with plastic wrap. Let rise until doubled, 2-3 hours in a warm place. Turn dough out on a lightly floured surface. Divide dough in half. 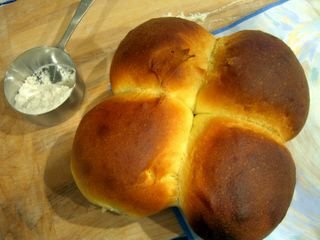 The dough can be shaped into two loaves as desired: two round loaves, two oblong loaves, two clover loaves (made with balls of dough) or shaped into rectangles and place in two, lightly greased loaf pans. Place free form loaves on a parchment-lined baking sheet. Cover dough with a clean dish towel and let rise for 45 minutes. Bake for 35-40 minutes, until golden. Loaves will sound hollow when tapped on the bottom. The best way to check for doneness is to insert an instant -read thermometer (like a meat thermometer) into the bottom of the loaf a few inches. The temperature will read 200F when the bread is done. Store in an airtight container or ziploc bag. *Note: Instant potato flakes make a great substitute for mashed potatoes. 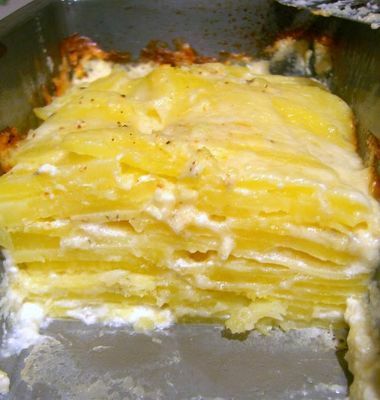 Use about 1/3 cup potato flakes with 1/2 cup hot water and let it cool slightly before adding to the yeast. Your recipe makes making sweet bread so easy. I have tons of recipes for sweet bread in my collection but they always made it seem like it would take all day to make. Growing up, we called this type of bread “Portugese Sweet Bread” never “Hawaiian Sweet Bread”. The King’s packaging was the first time I had ever seen this type of bread called hawaiian bread. Thanks for the recipe. I will be making this tonight and seeing if it compares at all to my mom’s more difficult Portuguese Sweet Bread. Think a loaf will freeze well? It would be great to have this on hand. Tina – I think it will freeze well, though I only ever use previously frozen bread for toast. The bread will keep in an airtight container for 3 or 4 days. This sounds great. We’re debating a move to Hawaii, so in honor of this, I think I’m going to have to try this bread! I really appreciate how so many of your recipes try to cut down on fat become healthier. Thanks! Michelle – Thank you for the kind words. And may I say : Wow, Hawaii! Sounds like a good move to me. First the gratin, now this? Are you trying to sabotage my low carb diet;)? This looks so beautiful. I baked a Portugese sweet bread out of “The Bread Bible” and it was good but not as tender as a Hawaiian bread. One question- the sugar in the dough really turns dark after a short time. Is there any way to prevent that so it doesn’t get burnt? I always have a problem with that. King’s Hawaiian Bread is a childhood memory for me too, but it doesn’t taste as good anymore, now that I know it has margarine and high-fructose corn syrup. I’ve been searching for a good recipe. Mr favorite sandwich bread is Martin’s potato bread and Chinese/Japanese-style pullman loafs. They are wonderfully soft yet dense, so you get more bread with each bite. Actually, just one slice is filling. They’re good with mayo, an over-easy egg and sandy-textured pork floss. Tokyoastrogirl – Rich doughs have to be baked at a low temerature for the very reason you pointed out, since sugar can burn. This dough shouldn’t get overly dark as it bakes, but adding a loose tent of aluminum foil once the bread has reached the desired color will prevent the crust from becoming too dark. Jessica – I don’t think I’m familiar with the chinese style pullman loaves, but I’ll have to look for them. They sound delicious. Nic, what a fluffy loaf of bread! Looks so soft and delicious 🙂 Must be great with a cup of hot tea. This bread looks awesome, it seems so tender! I like to make potato bread and am very interested in your recipe and want to try it soon! It may be silly, but I have a question… regarding the potatoes, do you boil, mash them and then measure the 1/2 cup?? Thanks for sharing the recipe! It looks really good! Ana – Yes, you would boil and mash, then measure half a cup of potatoes. It would probably only take 1/2 of a medium/ large potato. Don’t use leftovers that already have milk or butter added! I’ve made a great bread pudding using the Kings brand bread, this looks like a great way to make your own – Thanks Nic! I’m so glad you posted this-I love this stuff and haven’t found a recipe I really like so far. Oh, I love Hawaiian sweet bread. For reasons that are lost in antiquity, King’s is always the bread we eat with my sister’s famous killer spinach dip. Now I’ll have to try to make my own! Thanks for the recipe. I feel so lucky to have found your blog- it’s great! I have been baking a long time and find bread to be a special challenge. When I made this bread, I kept my fingers crossed and am pleased to report that it turned out amazing! I made one clover loaf and one bread-pan loaf for sandwiches. Had pb&j on it the first day and it was amazing. Made toast with it that night, and again…amazing! Tastes just like the store-bought kind with all the right airiness and sweetness. I had to let it rise a little longer than 45 min the second time but that’s it. Thanks for a recipe I’m sure to use again and again! Nic, my interest was piqued when you mentioned that this bread is also found in the Philippines, which is where I am. Judging from the texture and look of your bread, I’d have to say that this bread is what we Filipinos call monay (MOH-nay) rhymes with high. I must try this recipe! I have missed this bread since moving to the East Coast from Washington State where it was always available. When I was reminiscing about “Hawaiian Bread” one time and my husband had no idea what I was talking about, I realized how deprived his life has been without this great treat. Thanks for the recipe. I can’t wait to try it! Starchmouse – It sounds to me like you might have had the water too hot when you added it to the yeast. Hot water is the only thing that can really kill yeast, so it is important that the water only be warm when you add it. The water should not be over 110F when you add it. You can test this with a thermometer or by putting a few drops on the back of your hand, as you would test a baby bottle. I don’t think that you added too much flour because rich doughs like this tend to take a long time to come together. This bread is more difficult to make than some of the other breads on my site. I would also suggest that you make sure to let the bread rise until doubled, not just follow the recommended times I listed, in the event that your kitchen is cooler than mine. I’ve got to say, that bread looks great, nice work. Again, I’ve only ever heard of Portugese, hadn’t heard it called Hawaiian Sweet bread before. Do you think it would be possible to make this without yeast, using baking powder or somethign else instead? Hi Anonymous. It would definately *not* be possible to make this with baking powder or any leavening agent other than yeast. Unfortunately, yeasted breads just can’t work that way. i freeze kings for easier cutting. how can i do this in a bread machine? You can do this in a bread machine on a dough cycle–it works just fine. I put the first ingredients in and let them sit 5 minutes, then added the other ingredients the same way I would have in the mixer. I have made this three times now, and the texture is still not quite right. I think it may have to do with the yeast. I’ve had a lot of trouble with the rising–the first time I think the milk was wayy too hot, but even with making sure all the liquids were tepid, it still didn’t rise that much. I bake challah a lot (my recipe for it is at http://www.libraryladymom.blog-city.com/recipe_challah_rolls.htm) and it uses 2 TABLESPOONS of yeast. The Hawaiian bread is pretty similiar, so I think I’m going to try adding at least 1 full Tablespoon of yeast to my next batch. Texture or not, the flavor is WONDERFUL. My daughters are loving it, and I can’t thank you enough for the recipe! This is my second time making this bread. The first time it was great but the crust was really hard. I made a few changes this time one of which I let it rise overnight. It doubled big time. So I will post in a bit and let you guys know how it turns out this time. btw I am going to try the foil after it gets to a desired color. Kept all ingredients at room temperature unless warmed to touch. Substituted the mashed potatoes for the boxed. I kneaded it alot longer than 2-3 minutes … for like 6-8 minutes so it was nice and elastic when done. I skipped ahead and added the butter before I was supposed to so I cut in an extra 2 TB when that part came. Also, I forgot to add the lemon (and 1/8 tsp of ginger powder <– steal from another recipe) also when I was supposed to so I just added it during the final stage while dough was spinning on the hook. I used a hand mixer (with hooks) instead of a mixing bowl. Yeast type does make a difference! I used Red Baron's Active Yeast … last couple attempts for this bread I used Fleischman's Rapid Rise and it was gross! I ended up using 4 1/2 c of flour and as little as possible when kneading. Kept the rising environment warm in my oven by turning it on for 30 secs and off every 30-45 mins. Kept a thermometer in there so it was between 94 and 101 degrees. Set oven to 345 since it measured 355 at 350. I put in a meat thermometer at 25 minutes so that I would know exactly when the internal temperature hit 199.9 degrees … and perfection! I baked them in disposable tins and noticed a beautiful light sticky moisture between the bread and tin. Ugh YES! I saved the second loaf to retard rise overnight in the fridge to get it a little sour and will try baking that one tomorrow. Thank you so much for this recipe … been away at school in NY and was really in the mood for some Hawaii Sweet Bread … this was seriously the best I ever tasted trust me (I used to like Ani's #1) … AND being that this is my sixth recipe and attempt at making something remotely close to comfort, I do consider myself somewhat an aficionado on the subject. lol. I just tried this recipe today. It turned out well as rolls instead of a loaf (granted I may have over baked them slightly as they have a REALLY crusty shell) and the texture is right for Hawaiian rolls, but the taste was missing something. Maybe pineapple juice or a smidgen of ginger could help? Will this work with bread flour??? Yes will bread flour work? I’m curious too. I’m kinda scared to try Hawaiian bread. Tammy and Ann – All purpose flour is going to give you a softer bread in this particular recipe, but you can still make a flavorful bread with bread flour. Be careful as you add it into the dough, as you might need slightly less than you would all purpose. I tried it with the all purpose flour first, is was soooo good! Next time I’ll try it with the bread flour. Thank you so much for all your help and fantastic recipes! I changed the recipe and added 1/2 c golden flax seeds and used mashed sweet potato. the bread is wonderful.. and now it has some health benefits as well. thank you for the wonderful recipe. I have been looking for a Hawaiian Sweet Bread recipe without a bread machine for a while! I’d really love to adapt this for my own (small!) blog. I’d link back to you of course. Is that ok? No hard feelings if not, I’ll enjoy baking it anyway! Has anyone ever tried this recipe with a bread machine. just got one and it honestly makes things a lot easier just curious if anyone has any notes for making it that way. What about the pineapple juice that is in all the other recipes of Kings Hawaiian knockoff recipes? The original Kings Hawaiian rolls don’t include any pineapple juice on their ingredient list, which is why I didn’t include any here! Great question!